There's a crisp in the air, the leaves have changed colour, our wardrobe has changed from tanks and shorts to jackets and scarves. You get the picture. Fall is also a time when we are politely impressed upon with everything pumpkin. Let me say- there is nothing wrong with this delicious squash. I WILL say - Most of these pumpkin madness food products, sadly, do not contain anything that even resembles a pumpkin (cough, lattes, cough). 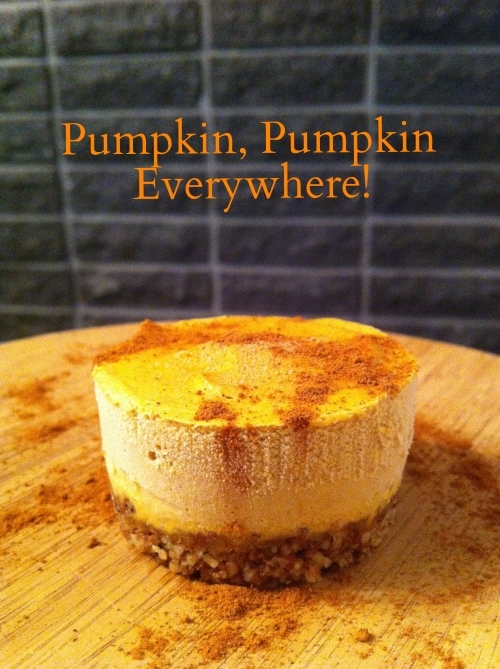 You have been warned :) Trick your friends and lovers with this (REAL) pumpkin cheesecake recipe. Process dates, walnuts and salt in food processor until walnuts are fine and dates are incorporated. Press crust into a 7" springform pan and place in the fridge to let set while making the filling. Place remaining ingredients except for the coconut oil into a blender and blend until smooth. Stream in the coconut oil while the blender is running at low speed. Pour the filling over the crust, firmly place the springform pan against the counter top. Do this a couple times to remove any air bubbles. Place cake in the fridge for 3 hours to let set. Make sure all the ingredients are at room temperature. To soak cashews, soak them overnight and rinse multiple times after soaking. You are getting rid of the enzyme inhibitors and making the food more digestible and nutrient dense by doing this. Use raw organic cashews if possible - this will be apparent in the texture.